Just a brief update for now, but I wanted to share a big project I just buttoned up. 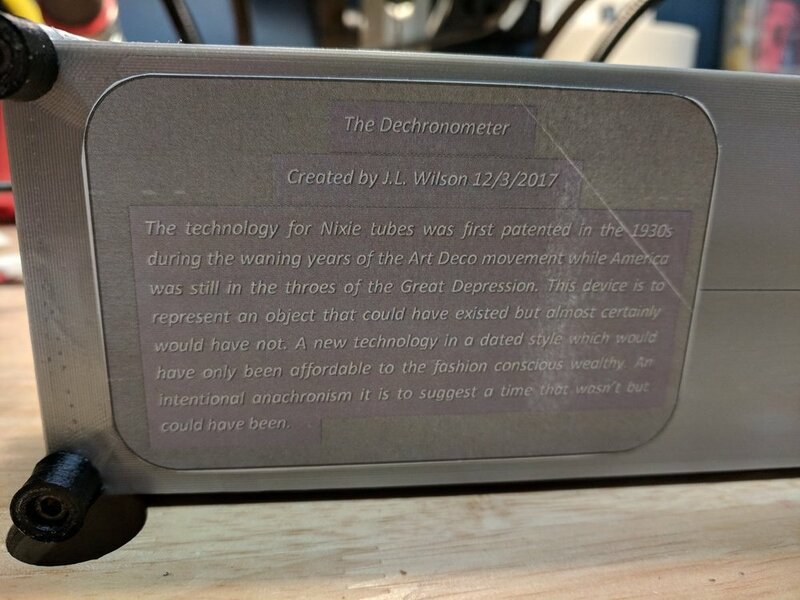 I made a sequel to the Dechronometer along with a user manual featuring photos of it's construction and a presentation box. 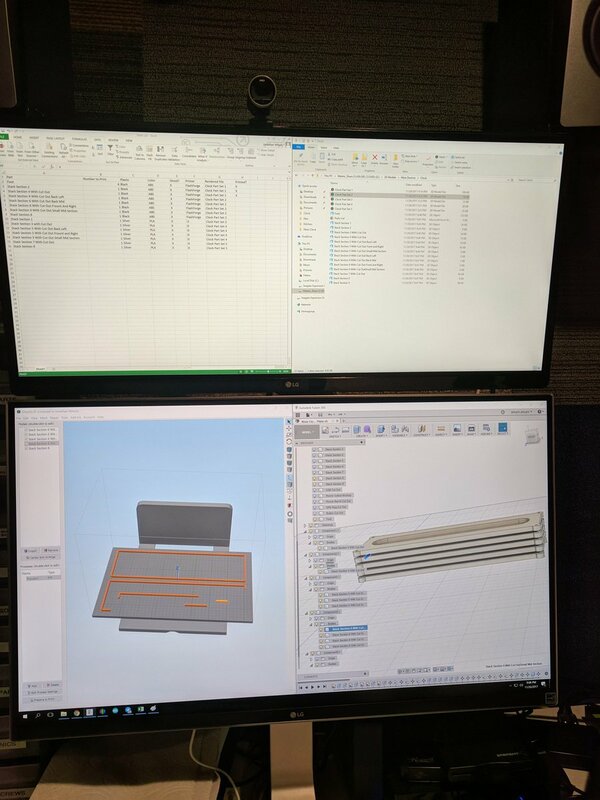 I'll post a whole write up soon, but I wanted to at least put up a teaser of the finished product. This weekend I set up my photography gear to get some better pictures of my recent projects. More are soon to come but here's a teaser. A view of my photography setup for doing macro work. Over the weekend I spent a few hours trying to eliminate the last of the signal noise on the Shure M65 clone. I added shielding to all of the input and output wiring and grounded the shielding back to the chassis ground point. Adding the Shielding to the I/O wires. Much to my dismay after adding the grounded shielding around the I/O wires the signal noise actually got significantly worse! It was so bad that I'd deem it unusable. 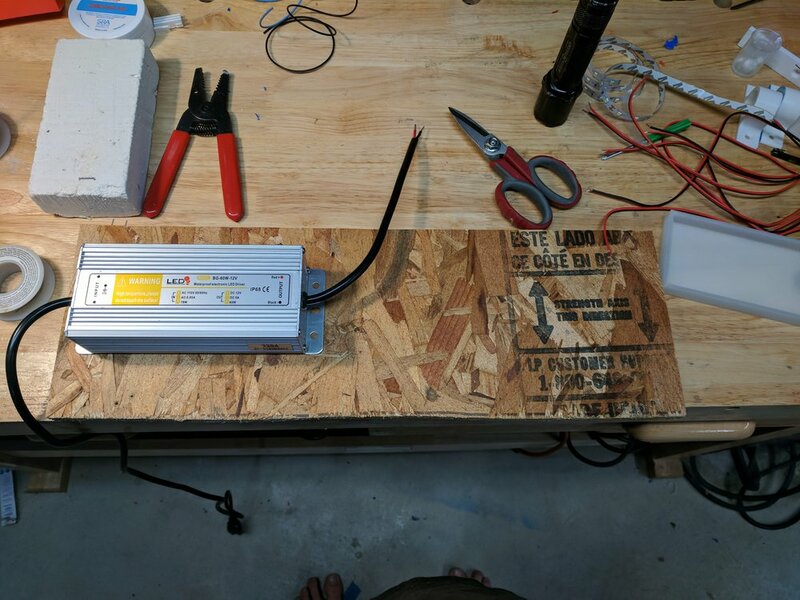 After doing some testing with decoupling the ground and trying some different chassis ground points I discovered that improving the ground connection from the chassis to the outlet ground by re-crimping then ground lug and removing the grounding wires from the I/O shielding was what it took to remove all the noise. It's been a long journey but I now consider the electronics finished! 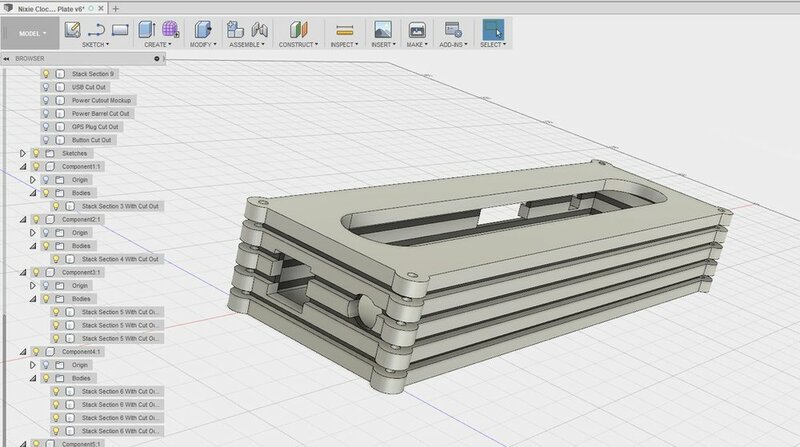 Next up will be completing the casement using 3D printed edge rails and acrylic panels. 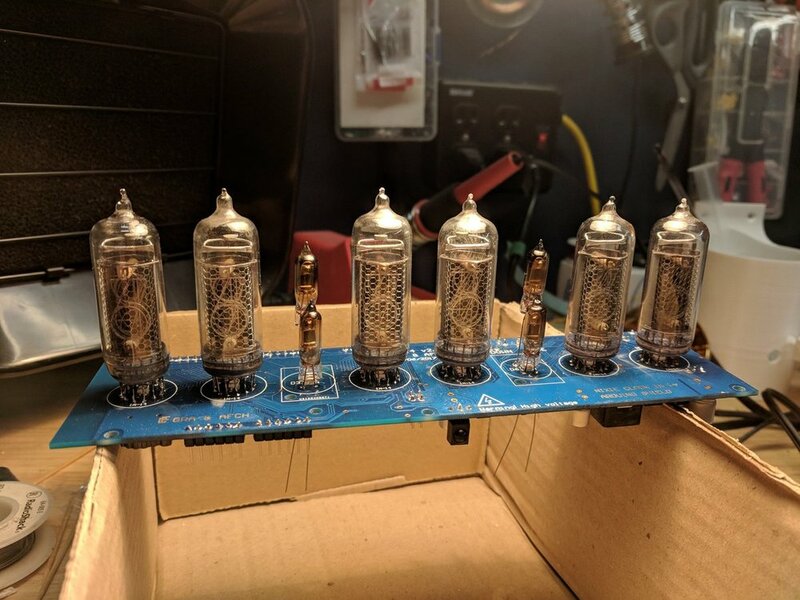 I plan to leave the sides and top transparent so that the electronics can be displayed and to install a removable top to make re-tubing easy. Here's the finished electronics as they stand! Front view of completed M65 electronics. 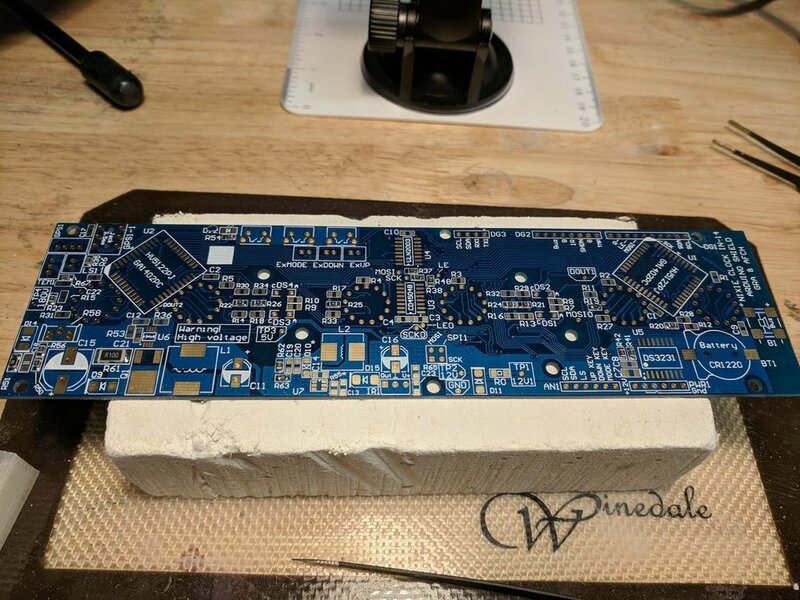 3/4 Overhead view of the Sure M65 clone. As part of the finish work I also installed the upgraded Electro-Harmonix Gold 12AX7s. They are a properly matched set and have almost 12db more gain than the outgoing JJs! 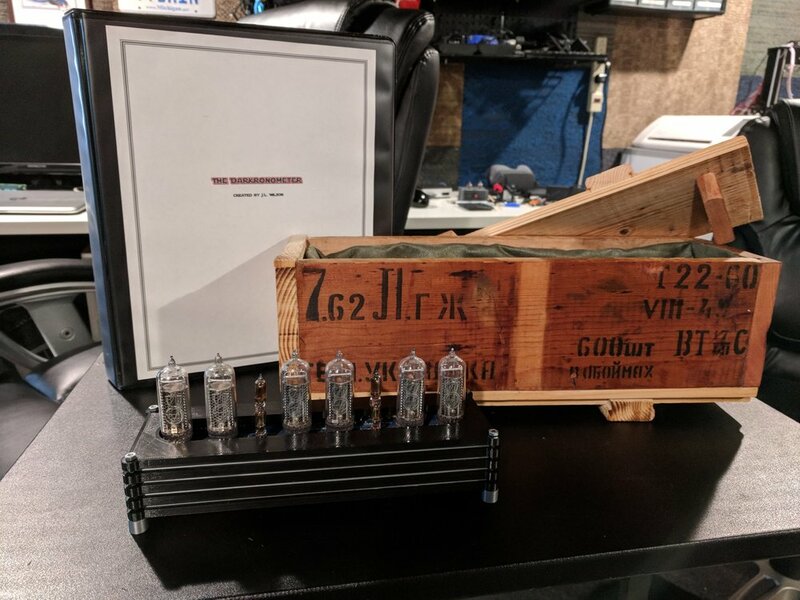 I am super pumped to move on to the next electronics project which will be an input switcher with an integrated preamp stage and a level meter VFD. Stay tuned for more progress on moving to an all analog listening room! 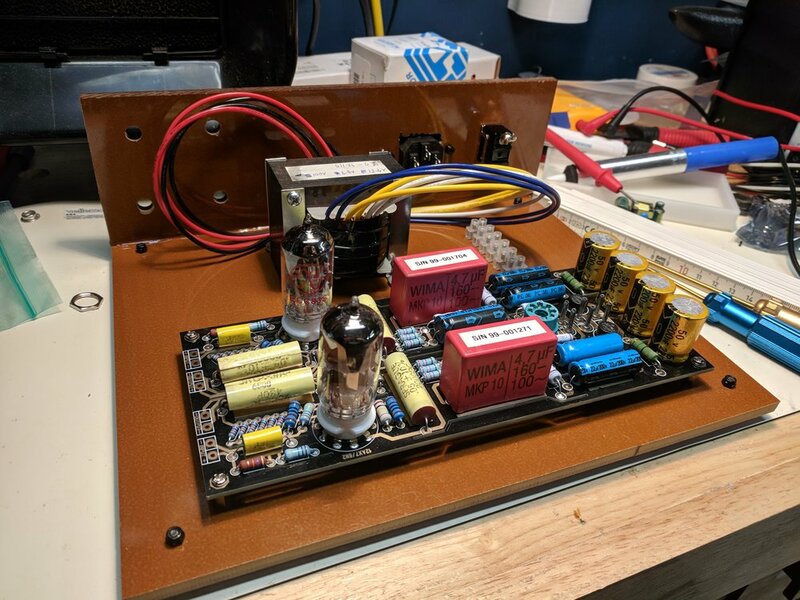 I ran into a small noise issue with the Shure M65 Phono Preamp so I decided that there was probably some EM interference going on due to the exposed transformer and the open chassis design. To remedy this I designed and printed and EM shield out of a conductive PLA filament which I then covered in a thin layer of copper tape. I attached this to the grounding plate and much to my delight it resolved the vast majority of the signal noise. 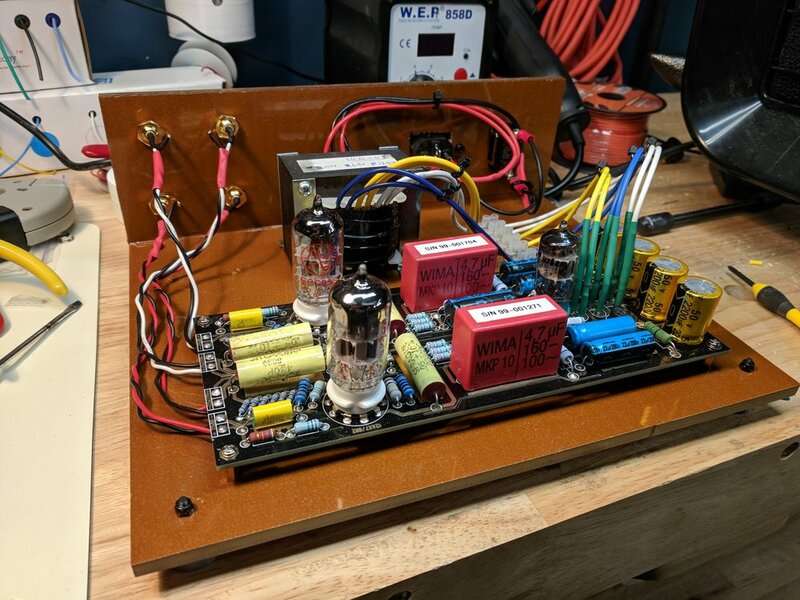 My most recent project has been building a clone of a vintage Shure M65 Phono preamp. 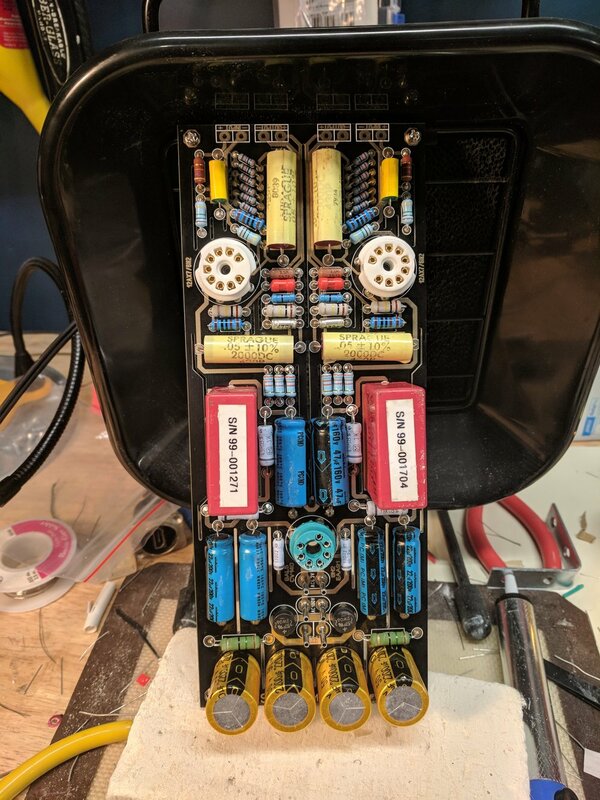 This design is old enough that it doesn't even use diodes in the power stage, instead relying on a 6AL5 compatible electron tube to act as a power rectifier instead of the usual 4 diode set up seen in more modern equipment. 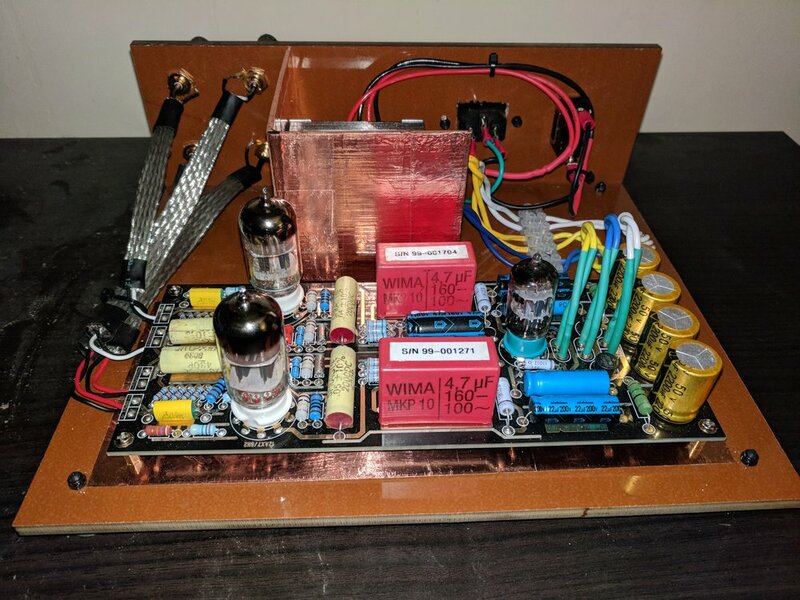 For amplification and RIAA equalization it uses a relatively straightforward circuit of 12AX7 tubes, capacitors, and resistors. 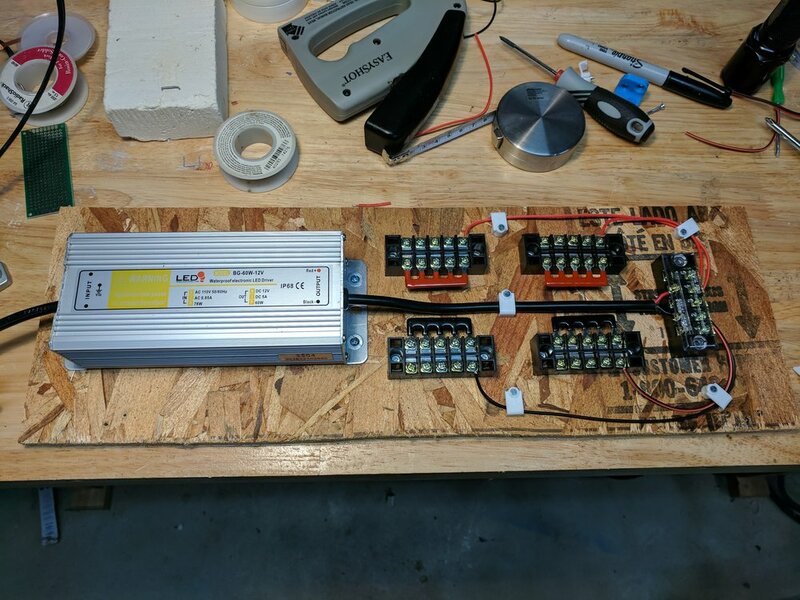 It uses a custom transformer to power it all since it requires 110v, 12.6v, and 6.3v AC current which was not something I was able to find as an off the shelf part. 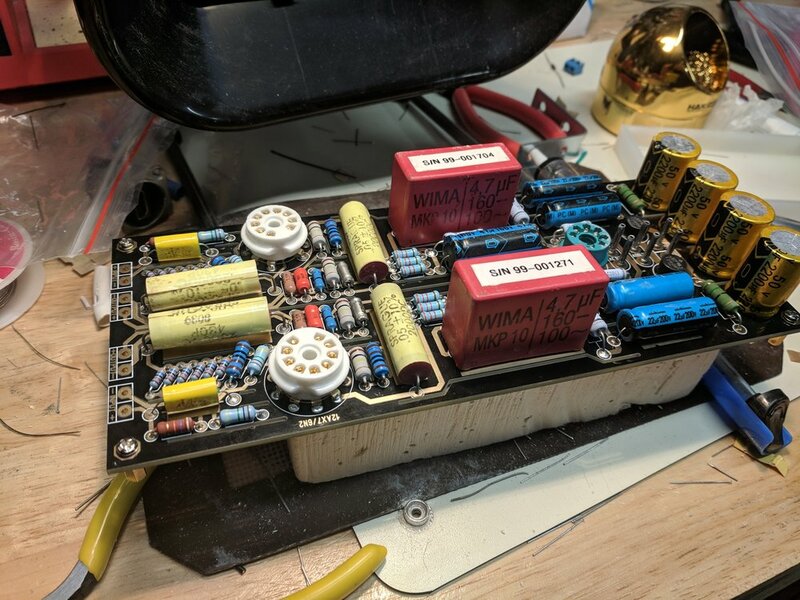 While I was able to source a vintage Philips Miniwatt tube for the power rectification stage I'm still hunting for a nice set of vintage tubes to replace the pair of JJ Electronics 12AX7s that I'm currently using. 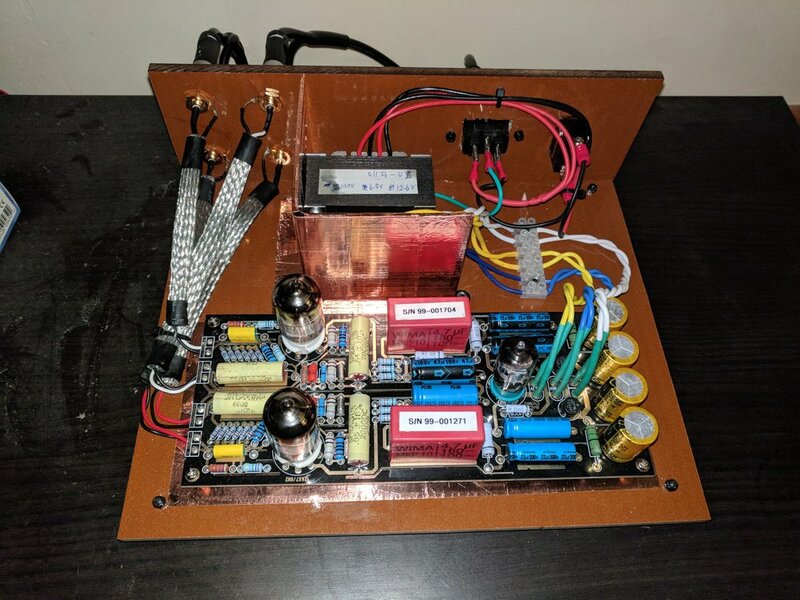 I'm still working on finishing the case, shielding, and grounding it but the electronics all work and it sounds amazing! Please enjoy this gallery of it's construction. 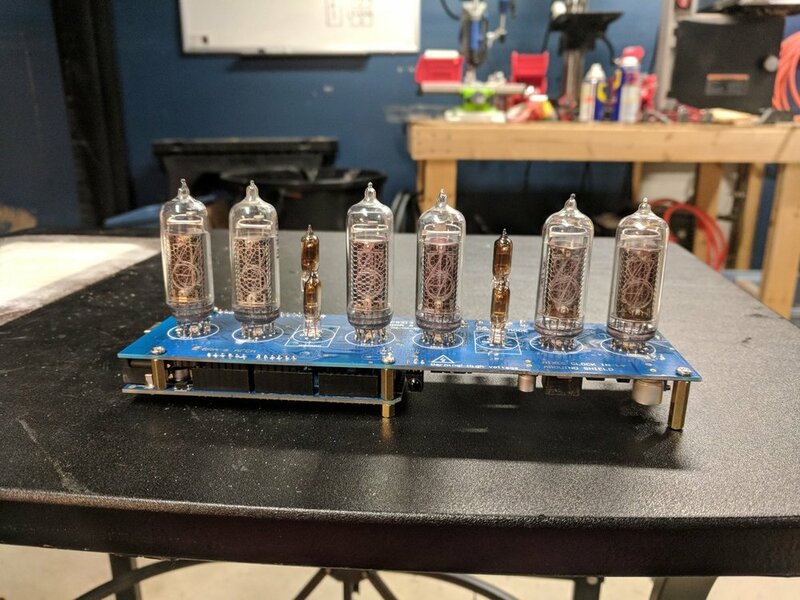 Nixie Clock Project - "The Dechronometer"
Over the past month I decided to take a crack at building my own Nixie tube clock. 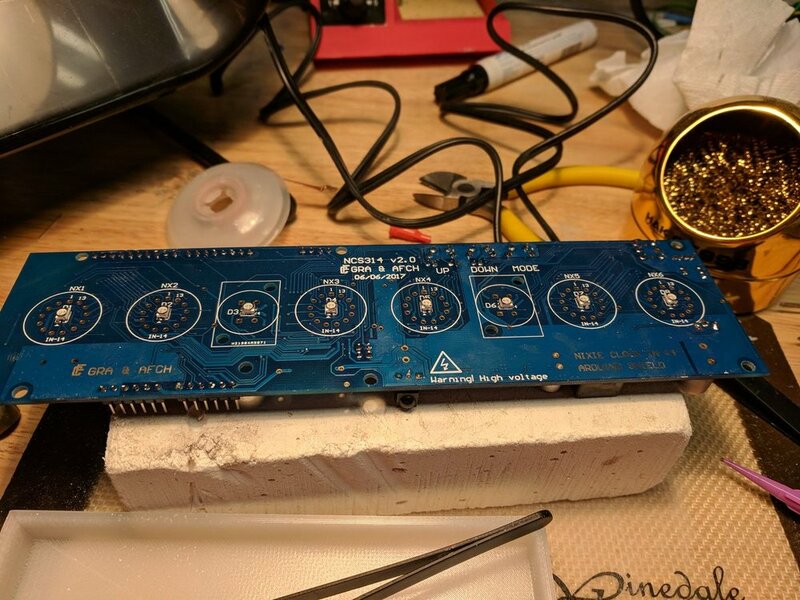 I chose a board from http://www.gra-afch.com/ due to the fact that it was one of the few designs that allowed the tubes to be controlled by an Arduino. 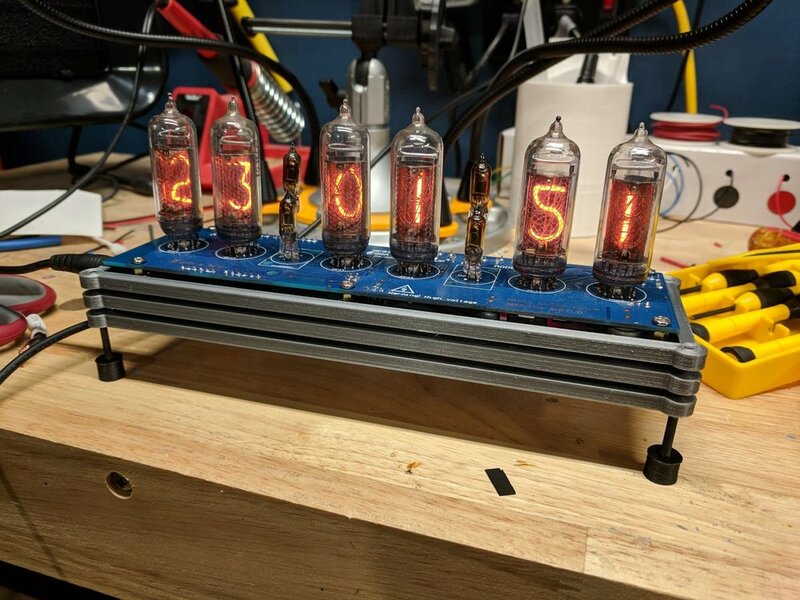 As I have a keen interest in micro-controllers I thought it would be neat to have the option in the future to make it display more than just the time. Below is a selection of images from the build and the final product. I hope you enjoy. 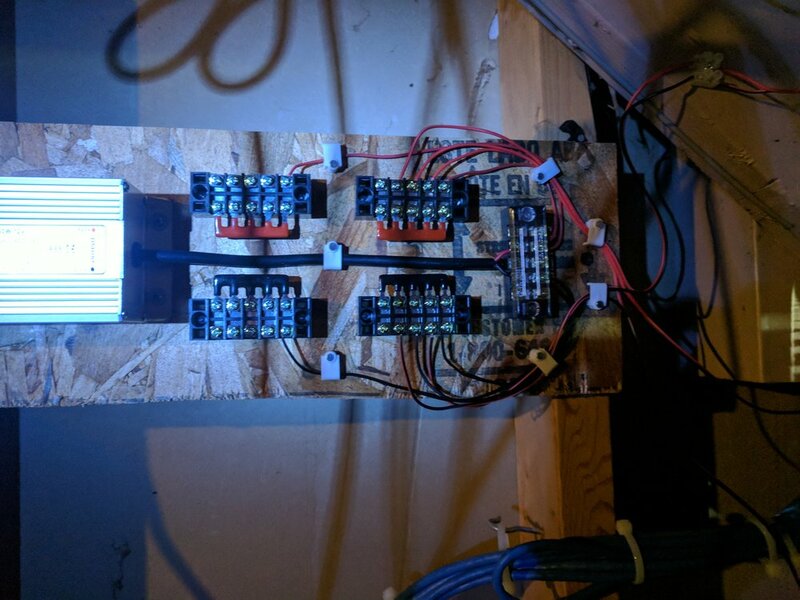 Here's a short video I took of the LED stair lighting in action. 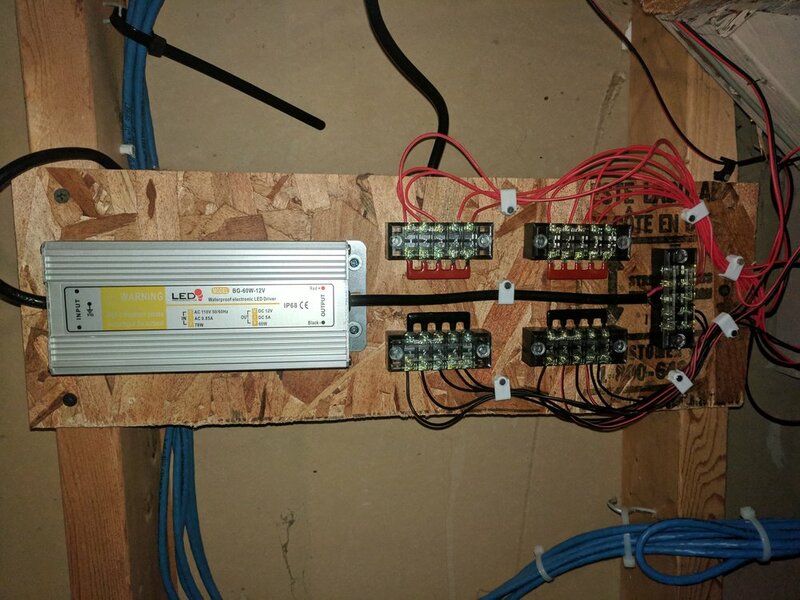 I've tied the lighting in to my Vera home automation controller to trigger on a slight delay after the overhead light at the bottom of the stairs comes on. Really happy with the outcome. 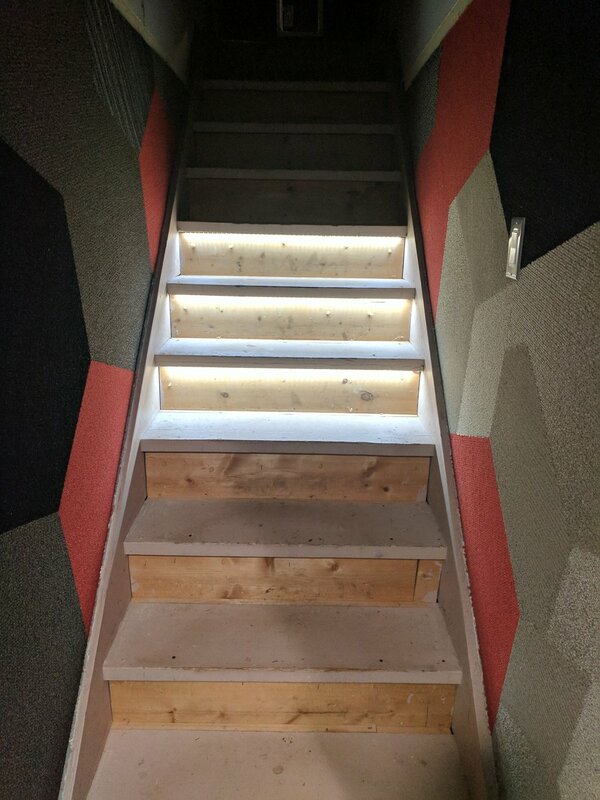 I've finished up the LED Stair lighting project! It was about 6 hours of work in total to install and wire everything. My next step will be cleaning up the stair faces and carpeting the tops of the stairs. In the mean time though my stairs are now much safer now that the stairwell is not so dimly lit. For a list of parts check the bottom of this post. Without further ado here's the finished product! Here's the view from the bottom of the stairs. I stopped a step short of the top as I didn't want the LEDs blinding people at the bottom of the stairs due to the viewing angle. I may add an additional strip with a deflector later. Here's the view from the top of the stairs; much easier to see where I'm going now! 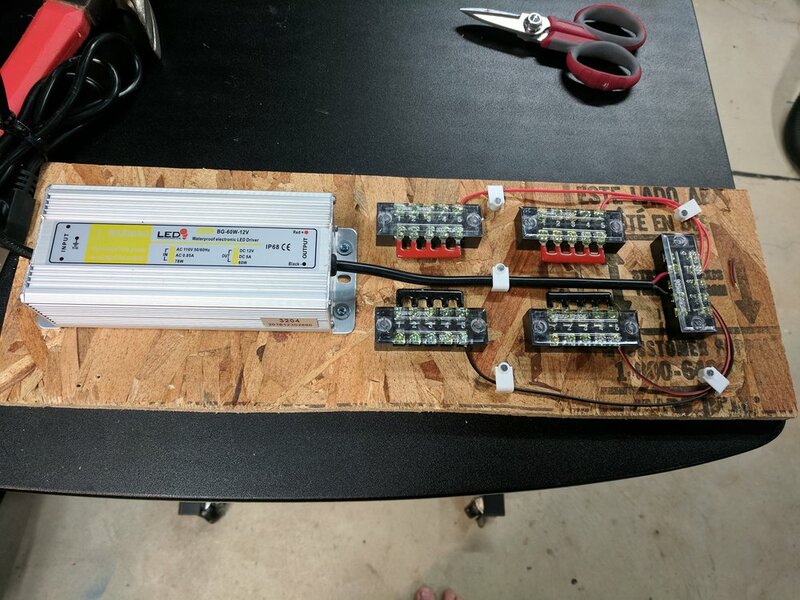 Here's the power distribution center that I put together for the LEDs. Its only running at roughly half rated wattage capacity so it should have a nice long lifespan. 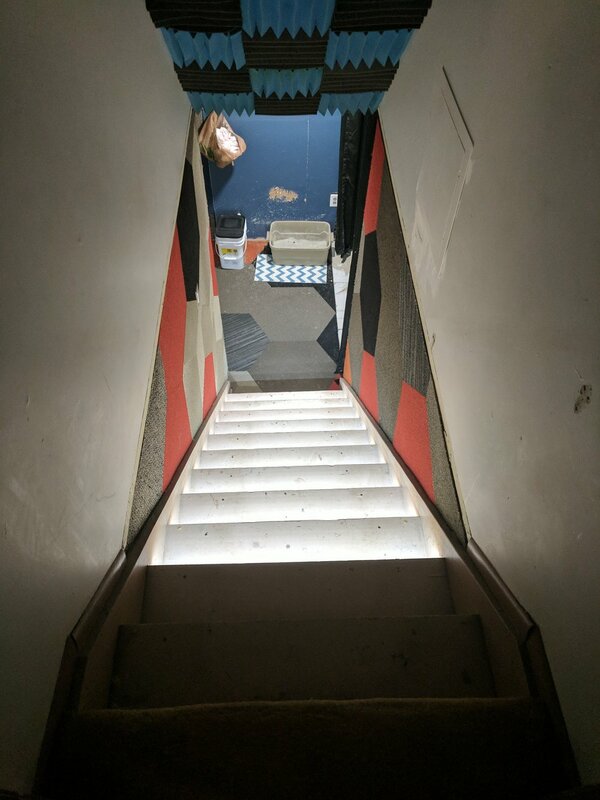 The stairwell from the main floor of my house to the basement was rather dark and due to the slope of the ceiling there isn't a good way to hand a light fixture over head. My solution was to put a strip of LEDs under the leading edge of each stair. 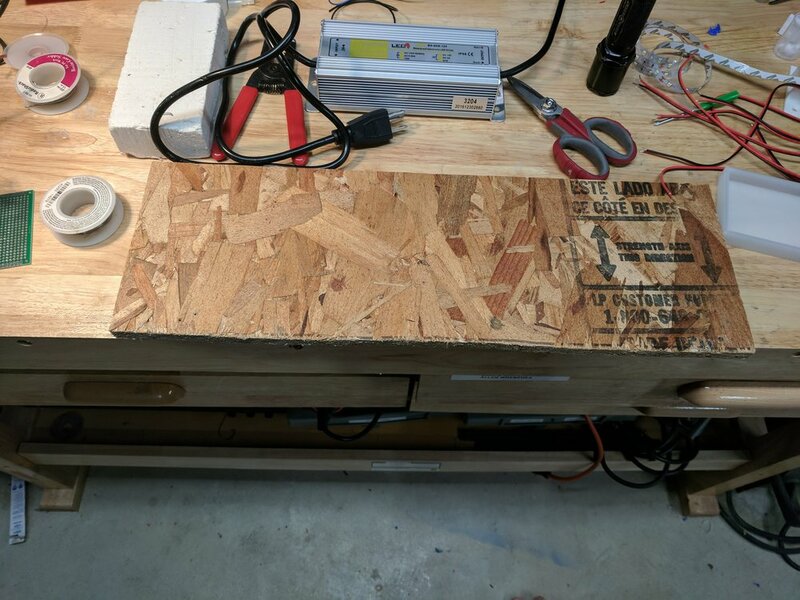 This gallery contains images of the 12v power distribution bus I put together and the resulting lighting on the stairs. This project is still in progress with more updates to come! Hey everyone! I'm starting a new website to better show off my projects and to allow people commission work from me. 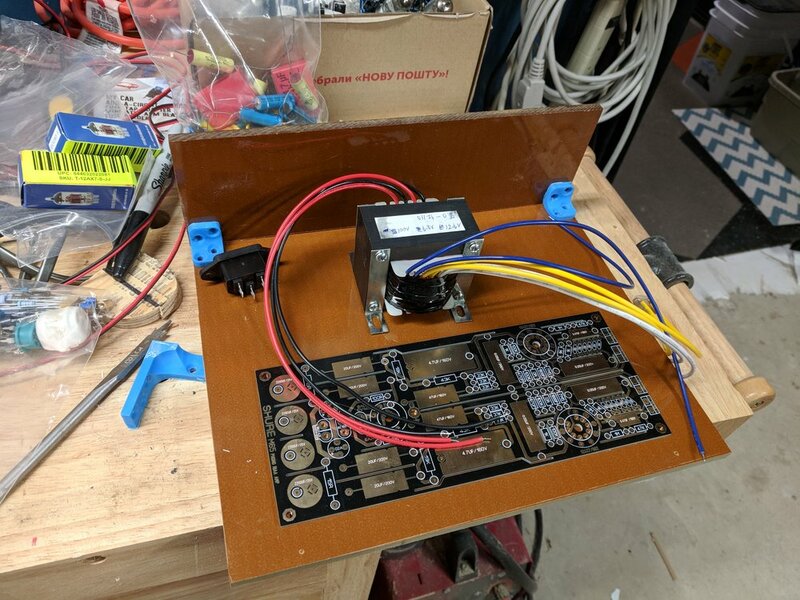 I'll be featuring build progress on the Deltabot Big, my 3D printing designs, prototypes, recipes, and art. I'll still be updating my Twitter account regularly but this will give me a place to go into greater detail on what I'm up to. Thanks for checking out my page!